There is a long, often inglorious, history of applying Quantitative Structure Activity Relationships, QSARs, to identifying trends within a dataset and to providing predictions for new molecules. On the plus side, a good QSAR reveals deep insights into which parameters are key to understanding trends in the data. On the negative side, there are many meaningless QSARs which have identified 3 or 4 parameters which give the best fit from 1000's of possible parameters, with no meaning ascribed to those parameters. It is just an exercise in statistics. The fit may or may not be good at predicting, but it provides no deep mechanistic insights because it is not based on any theoretical background other than the statistics of good fits. HSP on their own can provide much predictive power. But sometimes they cannot capture a more complex phenomenon. So we developed the HSPiP QSAR in the spirit of "maximum predictive power with minimum work". You can see the QSAR being used live in the video on the HSPiP Videos page. Instead of providing 1000's of meaningless parameters we have restricted ourselves to some 10s of parameters that have deep physical meaning - starting with the HSP themslves. You can choose the parameters you want (we generally start with the HSP then add others as necessary), or you can ask the program to suggest as few or as many as you wish. You can also click on each parameter and see instantly how strong (or weak) a correlation there is with the data. 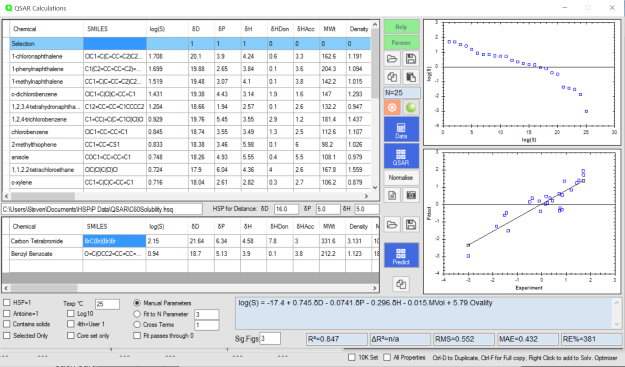 This is a super-fast way to spot key parameters for the QSAR, to which you can add extra parameters according to your chemical intuition. Finally, you can ask the program to identify "cross-terms" which signal interactions between properties. All you have to provide is a table with the name and SMILES of each chemical along with the data value. At a click of a button all the key parameter values are automatically estimated by the updated Y-MB engine. It's as easy as that. The example shown is the solubility of C60 in a range of rather unusual solvents. If you load another table of name and SMILES then at another click you can get predictions for each of those chemicals. In the example, carbon tetrabromide and benzyl benzoate are predicted to be great or good solvents. For further processing you can copy all your calculated data (including the predictions and the formula) to put into Excel. We provide a tutorial along with a big range of datasets taken from the literature (the C60 set is one of the examples). We provide our own choice of parameters - our judgement of what makes a good fit, but you can easily add or change parameters according to your chemical judgement. Rather quickly you will become a QSAR expert, ready to work on your own datasets. There are many other options to give you the most predictive power for the least effort. QSARs are not magic and are not infallible. With enough parameters you can fit anything, but lose all explanatory power. But our own experience using our own QSAR tool while it was under development is that for some problems it provides a rich way to explore complex phenomena and it can help you to create formulations (and patents) that would not have been possible without it.